Welsh Quakers were some of the earliest emigrants to Pennsylvania. Through their industrious habits, they made significant contributions to the colony’s development and played a key role in its political, social and economic formation. Religion was the primary push factor for most of these early Welsh emigrants. The Quakers had been harshly persecuted in their homeland. Parliament had passed stringent laws forbidding their public worship, and enforcing fines and imprisonment on any who disobeyed. William Penn, an English Quaker with Welsh roots, had recently been granted a charter from King Charles II to establish a colony in the New World. This colony was to be called Penn Sylvania, or “Penn’s Woods”. In establishing this colony, Penn’s goal was to provide a safe religious haven for the persecuted peoples of Europe. Faced with trying circumstances in England, the Welsh Quakers saw Pennsylvania as a secure haven from English religious oppression. Penn’s Welsh ancestry and Quaker heritage gave the Welsh Quakers the resolve and confidence needed to emigrate to his colony. With the promise of great economic opportunity and the assurance of complete religious liberty, a committee of Welsh Quakers met with William Penn in London to negotiate the purchase of a tract of land. The Welsh committee, headed by John ap John, approached Penn with their desire to buy a piece of land where they could form a distinct Welsh settlement where they could maintain their own language and customs. They proposed a self-governed settlement in which they would handle any quarrels or crimes in their own way and their own language. 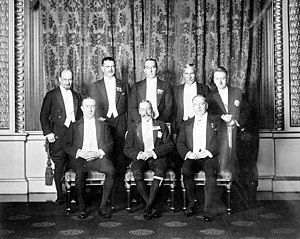 An agreement was reached between Penn and the Welsh committee; however, it was a fully verbal agreement (which would later lead to some controversy). Nonetheless, the committee was satisfied at the time, and arrangements were made to purchase forty thousand acres. Thirty thousand acres were put in the names of select Welsh leaders who acted as “company heads”. Some of these men purchased the land for themselves, while others acted merely as trustees and eventually parted the land out to settlers. The other ten thousand acres of the Welsh Barony were to be distributed by Penn himself to additional settlers. Settlement took off rapidly, and the Welsh Barony was quickly populated by numerous Quaker families. Estimates show that between 1662 and 1700, the Welsh made up the largest immigrant body in the state. The original townships of Merion and Haverford soon overflowed into new townships in Radnor and Goshen. Soon Tredyffrin and Uwchlan were established, and before long, the rest of the barony was settled. The Welsh Quakers were typically well-to-do, industrious folks. They built up and developed their land quickly, and lived fairly luxurious lives for early pioneers. For some time, they did indeed govern themselves as the Welsh Barony; however, the system soon disappeared as the Welsh merged into the general population. Over the next few generations, the Welsh language died out as the Quakers took to speaking English. Nonetheless, the relatively small group of Quakers gained surprising eminence in the region, and to this day, their influence can be felt. For 5 years Gill Mawson has been interviewing evacuees who fled Guernsey, in the Channel Islands, to England, just before the Germans occupied the islands in June 1940. 17,000 children and adults left Guernsey, which was British territory, with the majority arriving in England with just the clothes on their backs. Whole schools were evacuated with their teachers, and some reopened in England during the war as ‘Guernsey schools’ so that the evacuated teachers and pupils could remain together. One school was financially supported by Americans, with one child being sponsored by the President’s wife, Mrs Eleanor Roosevelt. The only communication between England and Guernsey was through 25 word Red Cross letters. The evacuees remained in England for five years until the war ended. 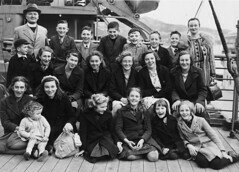 Some evacuees chose not return to Guernsey but to remain in England where they had settled into their local communities. It is not known exactly how many more Channel Islanders in Canada carried out this wonderful work, but their efforts clearly went a long way in helping hundreds of unfortunate evacuees in England who had been torn from their homes.